Although you must ensure that your data warehouse fits your own unique needs, some guidelines can help you determine the probable complexity of its environment and structure. 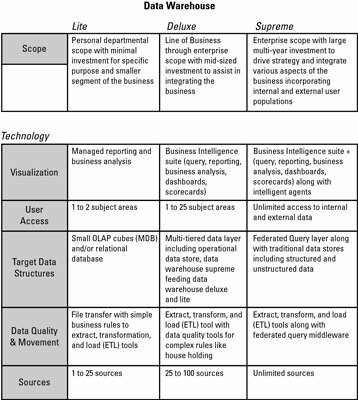 One good setup is to use a three-tier classification for planning a data warehouse. By determining a likely category for an implementation, you can have — early in the project — some specific guidelines for the project’s complexity, development schedule, and cost. Each of these classifications of data warehouses implements various aspects of an overall data warehousing architecture, as shown in this figure. Subject area and data content: The content of a data warehouse is grouped by subject areas. A subject area is a high-level grouping of data content that relates to a major area of business interests, such as customers, products, sales orders, and contracts. Subject area and data content will drive your user access to this data and the associated presentation through business intelligence tools. Data source: Data sources are very similar to raw materials that support the creation of finished goods in manufacturing. Your data sources are the raw materials that are refined and manufactured into the subject area’s data content. Depending on the class of data warehouse you’re building, you might have more comprehensive data sources — all dependent on the business user’s requirements. Business intelligence tools: The user’s requirements for information access dictate the type of business intelligence tool deployed for your data warehouse. Some users require only simple querying or reporting on the data content within a subject area; others might require sophisticated analytics. These data access requirements assist in classifying your data warehouse. Database: The database refers to the technology of choice leveraged to manage the data content within a set of target data structures. Depending on the class of data warehouse, a personal, departmental, or enterprise database management system may be required. Data integration: Data integration is a broad classification for the extraction, movement, transformation, and loading of data from the data’s source into the target database. This is where the business rules are put to action to ensure that the data content is of the highest possible quality for broad user adoption.